Dr. Ali Sepehr focuses his eyelid surgery goals around increasing the quality of human interaction and restoring the patient’s youthful appearance. Irvine, CA – Dr. Ali Sepehr, an Irvine facial plastic surgeon, considers the eyes to be the most expressive feature of the face. Since the upper and lower eyelids have such a large effect on the appearance of the eyes, many of Dr. Sepehr’s patients use blepharoplasty (eyelid surgery) as a way to dramatically rejuvenate the look of not only the eyes, but the face as a whole. In regard to the process of eyelid surgery, Dr. Sepehr says patients can often have their upper and lower eyelids treated comfortably without the need for anesthesia. He notes that the healing process typically involves little to no pain. Dr. Sepehr says his patients often comment how surprisingly easy the process was from start to finish—and how they wish they had the surgery performed sooner. Ultimately, Dr. Sepehr says eyelid surgery can be a very effective way for patients to achieve a more youthful, refreshed appearance by reducing signs of age that often take shape around one of the most prominent facial areas – the eyes. Dr. Ali Sepehr earned his medical degree from the University of California, Los Angeles School of Medicine and has focused his career in the art of facial plastic surgery. He completed a residency in Head and Neck Surgery and Facial Plastic and Reconstructive Surgery at the University of California, Irvine and a fellowship in Facial Plastic and Reconstructive Surgery at the University of Toronto. In addition to authoring scientific papers in various facial plastic surgery journals as well as chapters in textbooks, Dr. Sepehr teaches fellows, residents, and medical students from University of California, Irvine Medical Center. He is available for interview upon request. 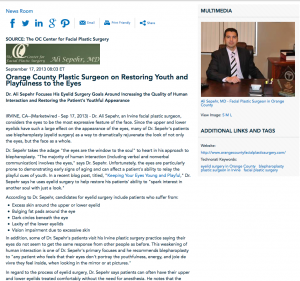 For more information about Dr. Ali Sepehr and The OC Center for Facial Plastic Surgery, visit orangecountyfacialplasticsurgery.com or facebook.com/ocfacialplastics.